Time is fleeting during these December days. The calendar continually grows fuller, as events and errands are penciled in for the evenings and weekends. With shopping to do and friends to meet, the holiday season is passing by too quickly. After realizing earlier this week that there are only two weekends before Christmas, I panicked. How would I be able to fit in everything without being overwhelmed? I stepped back for a minute, took a deep breath, and scheduled in time for myself. Time is one of the most precious gifts we have to share—with ourselves and others. As an introvert, I enjoy keeping my free time to myself, but I often remind myself the value of sharing time with the people I care about the most. Phone calls and coffee dates often carry more meaning than we anticipate. I'm holding onto those important moments this season. One of my personal holiday traditions is baking and decorating holiday cookies. Each year I look forward to putting on a cheesy holiday movie marathon and spending time in the kitchen doing something I love. Though decorating may grow old after several long hours, the joy of being able to share the results is enough to keep me going. Even though I blocked out time for myself next weekend, I started the holiday baking early with these Peppermint Chocolate Cookies. Buried in a pile of recipe drafts, I found a loved, but forgotten recipe for double chocolate chip cookies. I dressed up the cookies with a chocolate glaze and crushed candy canes. 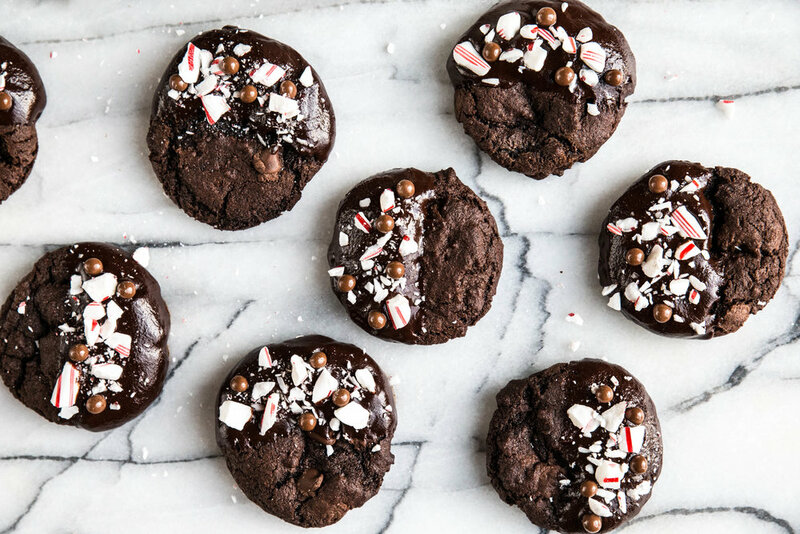 To suit your tastes, feel free to leave the chocolate chips out of the batter for less intense chocolate flavor, or add a hint of peppermint extract to the batter to boost the candy cane flavor. Either way, it's difficult to go wrong with this recipe. 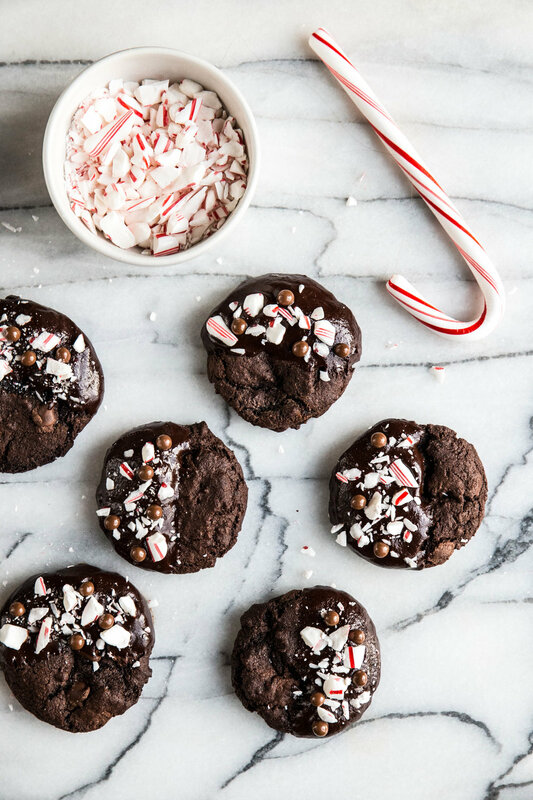 Peppermint Chocolate Cookies are a seasonal delight. Double chocolate cookies are half-dipped into a rich chocolate glaze. Before the cookies set, they are sprinkled with crushed candy canes and crunchy chocolate sprinkles. For extra peppermint flavor, add 1/4 teaspoon of peppermint extract to the cookie batter. 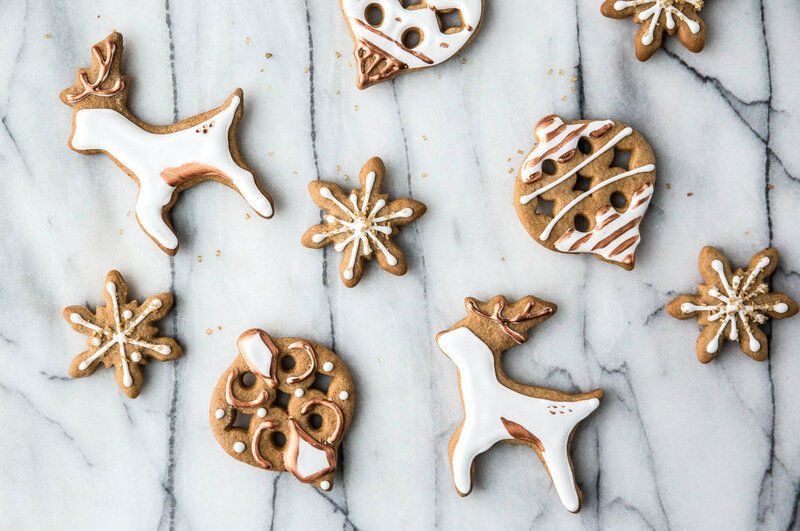 These cookies are perfect for cookie exchanges, holiday gatherings, or dipped into a tall glass of cold milk. In a large mixing bowl, beat together the butter and sugars until light and fluffy. Add the egg and vanilla extract and continue beating until smooth. 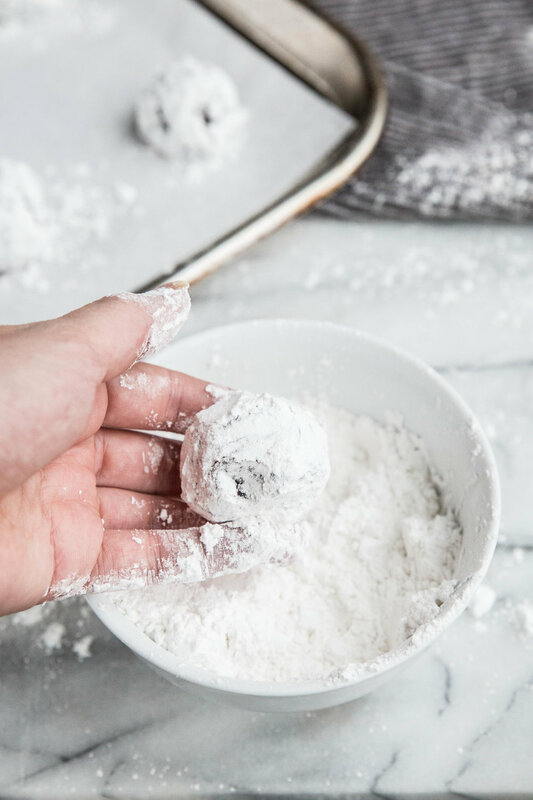 Gradually add the baking soda, salt, flour, and cocoa powder, mixing until uniform. Stir in the chocolate chips, if desired. 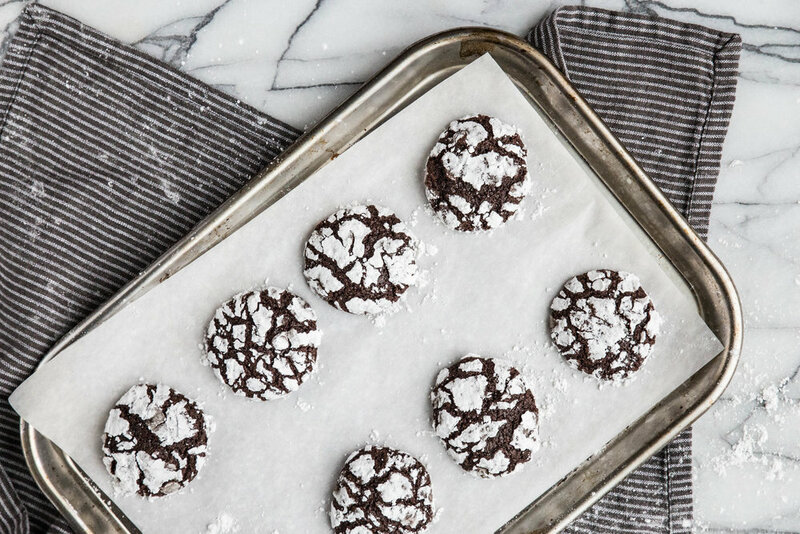 Drop dough by the tablespoon onto a cookie sheet. Bake for 10-12 minutes, or until set. Allow the cookies to rest on the cookie sheet for a few minutes. Then transfer to a cooling rack to cool completely. For the chocolate glaze, bring the heavy cream to a near boil in a small saucepan. Immediately remove from heat and pour over chopped chocolate, allowing the chocolate to melt for 5 minutes before stirring until smooth and uniform. Set aside. To decorate cookies, dip half of the cookies into the chocolate glaze. Sprinkle crushed candy canes and chocolate crunch sprinkles over the chocolate. Allow cookies to rest until set before eating.